While we were down south, there were a couple of days the weather wasn’t right for hitting the beach, so we explored the area for a few fun things to do. 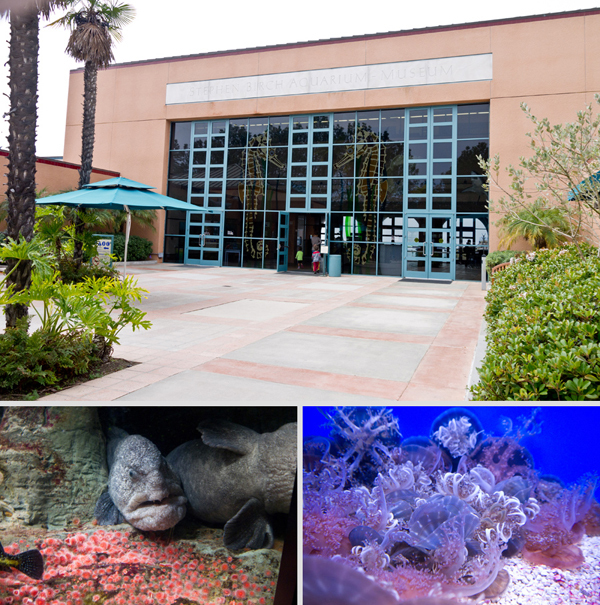 And we found ourselves heading to La Jolla for a stroll through the public exploration center for the world-renowned Scripps Institute of Oceanography at UC San Diego Birch Aquarium. Located next to each tank are helpful plaques sharing facts about the fish and other sea life, perfect for us adults that have no clue what we’re looking and then can utterly amaze our not-yet-scholarly tots by reading (without them realizing it) bountiful information about the amazing sea creatures. And it’s great for older kids, allowing them the opportunity to learn more on their own. We loved this huge tank filled with coastal sea life. 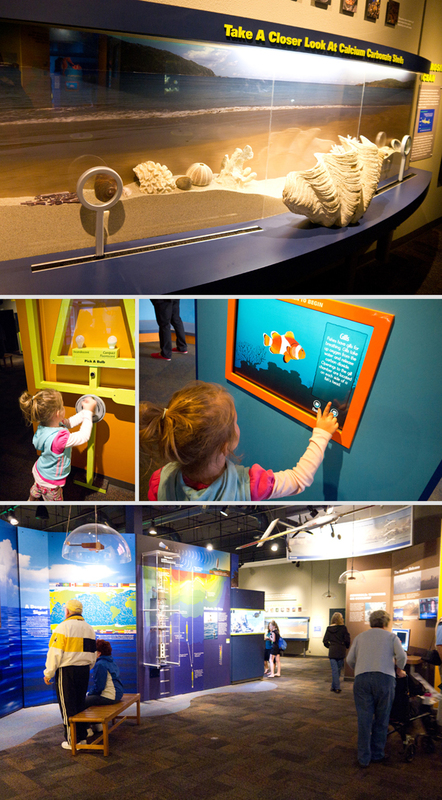 And part of the aquarium is dedicated to educational and interactive learning about the sea and California coastline. Most of it was totally advanced for our daughter, but that didn’t stop her from putting her hands on everything. But the seahorses stole the show. We were all impressed and amazed by these little creatures. A whole wing is dedicated to educating the public about the lives of seahorses, sharing how the aquarium is helping to nurture and build their numbers, and showcasing the amazing beauty of the cool sea animal. And we had such a great time, we ended up walking (well, running) through the aquarium one last time at the tot’s insistence to see it all over again. 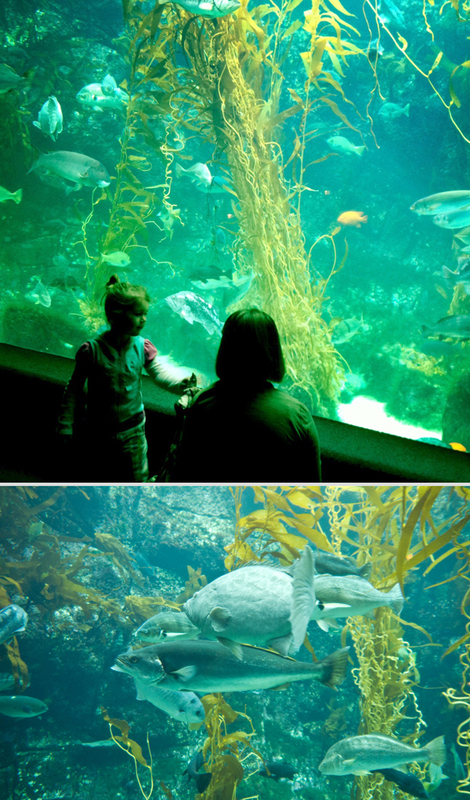 Along with the indoor tanks, the Birch Aquarium has outdoor interactive tide pools, a shark tank (not interactive), and some really cool solar activities for the kids to check out. 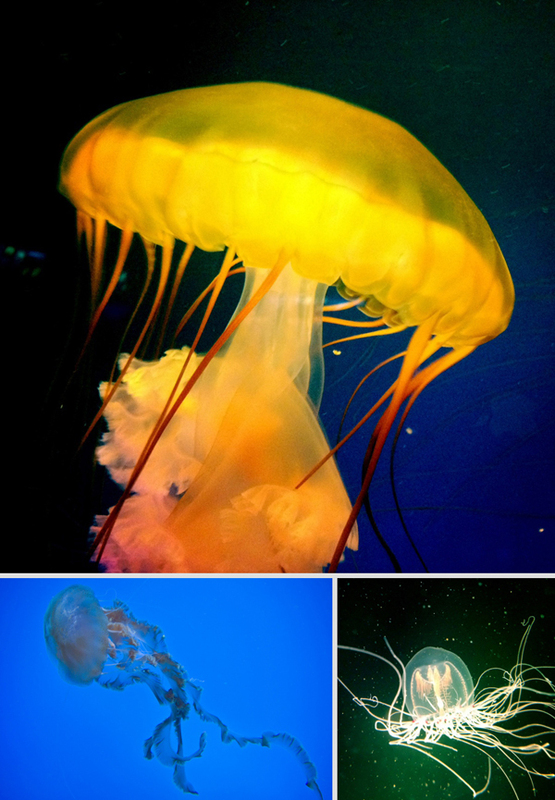 Perfect for kids of all ages, the aquarium has something for everyone, is easy to navigate, has a small outdoor snack bar on site, a gift shop, and wonderfully friendly staff. If you’re in the La Jolla/San Diego area, it’s a fun way to spend an overcast day. *If you’re not from the area, please, PLEASE, make sure to have directions before you head out to La Jolla. No joke, every time we go to La Jolla from the north, we get lost. It’s really not crazy difficult or anything, there are just a few twists and turns that can catch you by surprise.